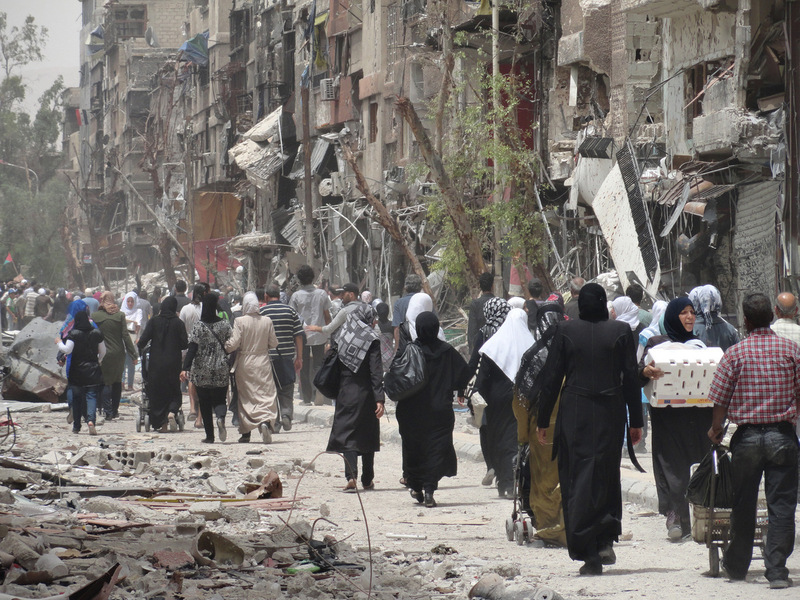 When the history of the Syrian Civil War is written, the assault on the Palestinian refugee camp in Yarmouk will be noted as one of its most shameful chapters. 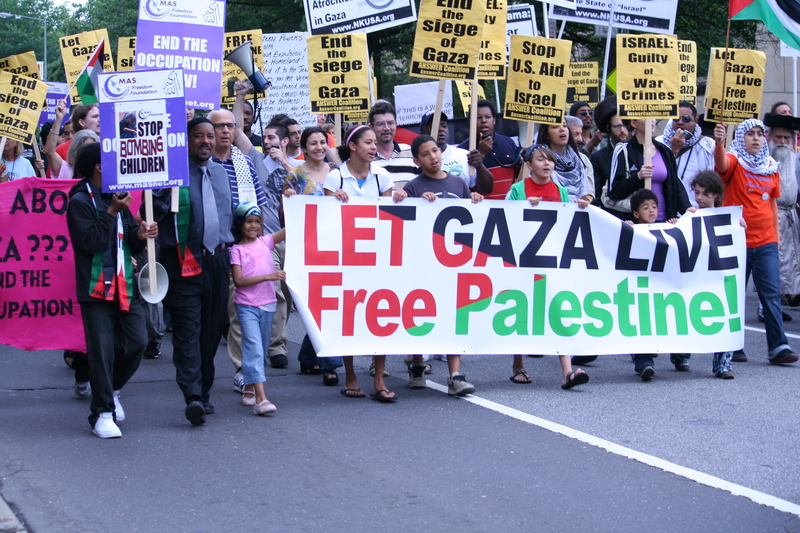 So why was the international pro-Palestinian community silent? Nearly one year after the war in Gaza, another, far bloodier Palestinian tragedy has been taking place elsewhere in the Middle East—not quite outside of the news media’s gaze, but not quite receiving its frenzied attentions either. The Islamic State’s recent conquest of Yarmouk—a once thriving Palestinian suburb with the formal status of a refugee camp that lies on the outskirts of Damascus—provides far more than just insight into which aspects of the Palestinian plight get editorial privilege and which do not. Since the strangulation of Yarmouk began in 2012, the fate of its people has offered a bald reminder that within the Arab world, Palestinians still encounter an ambivalence that can spill into open contempt. Just as instructive, and certainly more novel, is the realization that the global Palestinian solidarity movement, by not holding mass demonstrations highlighting the slaughter and starvation in Yarmouk, has become complicit with the dictator Bashar al-Assad and the beheaders of IS. Both Assad and IS are culpable for Yarmouk’s wretched situation, with Assad taking the lion’s share of the blame. 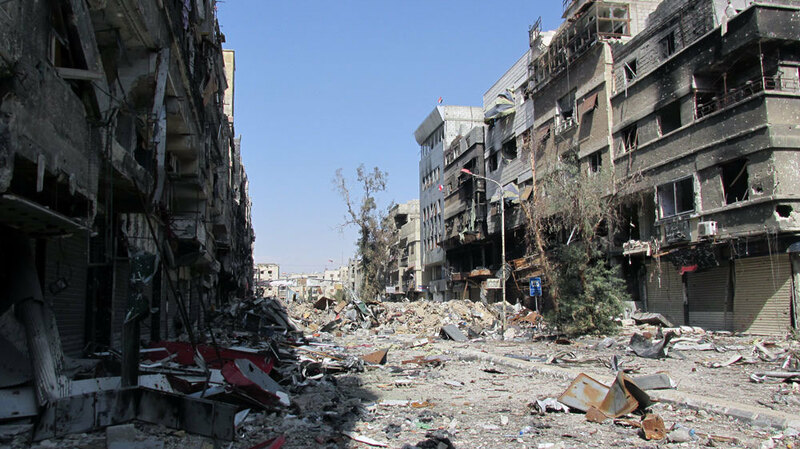 In response to the appearance of Free Syrian Army (FSA) fighters in Yarmouk, often backed by local Palestinian factions, Assad began a brutal campaign of air strikes in December 2012. By the early summer of 2013, Yarmouk was under a full-blown siege, with water, electricity, and food supplies cut off from its residents. According to current estimates, around 18,000 of an original population of 160,000 remain in Yarmouk, exposed to the full horrors of Syria’s civil war—malnutrition, displacement and the deadly, systemic abuse of basic human rights that has left almost 200,000 dead and a staggering 10 million people, more than half of the country, displaced within or outside its borders. From the beginning, conflict between Palestinian factions also played an important role in weakening Yarmouk from the inside. In February 2013, the Electronic Intifada, a virulently anti-Zionist website, carried an interview with Mutawalli Abu Nasser, a Palestinian activist in Yarmouk. Abu Nasser had once been a supporter of the Popular Front for the Liberation of Palestine (PFLP), established in 1967 by George Habash, a Christian whose ideology was a supremely intolerant fusion of Marxism and Arab nationalism. While the PFLP was known primarily for its brutal terrorist operations against Israelis and Jews (including its collaboration with the left-wing German terrorists who forcibly separated Jewish from non-Jewish passengers following the 1976 hijacking of an Air France plane to Entebbe in Uganda), Arab regimes were wary of the group because of its shrill revolutionary rhetoric. In humanitarian terms, the cost of this breakdown was astronomical. 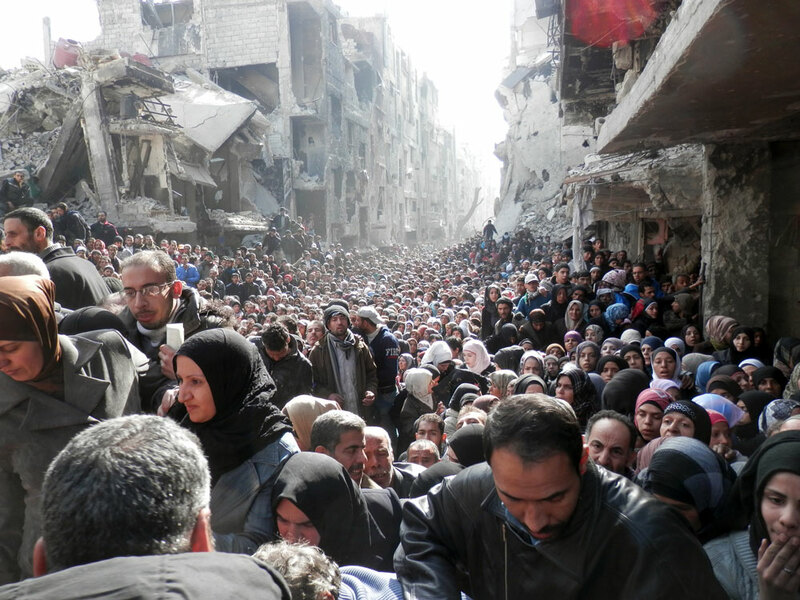 Already in 2013, Abu Nasser was describing a Yarmouk that had “been transformed from a lifeline to a bullet-riddled, bloodless body.” Yet, as Qusai Zakarya pointed out, it took the appearance of Islamic State to convince the world that a modicum of concern for Yarmouk’s suffering was warranted. The scale of that suffering certainly deserves a descriptor like “Nakba,” the Arabic word for catastrophe that is commonly invoked in discussions about the fate of Palestine’s Arabs during Israel’s 1948 War of Independence. However, despite the fact that Yarmouk is by some measure the worst blow taken by the Palestinians in nearly seven decades, the legions of Palestine solidarity activists in the West have remained unmoved. Their silence is, in many ways, confirmation of the suspicion that the Palestine solidarity movement is motivated primarily by detestation of Israel’s existence, rather than advocating for Palestinians wherever they may be. On April 9, at the height of the Islamic State incursion into Yarmouk, I checked the websites of five leading Palestinian solidarity organizations—the Al Awda-Right to Return Coalition, the International Solidarity Movement, the U.S. Campaign to End the Israeli Occupation, Students for Justice in Palestine, and the UK-based Palestine Solidarity Campaign—to see what they were doing for the Palestinians of Yarmouk. The answer, quite literally, was nothing. 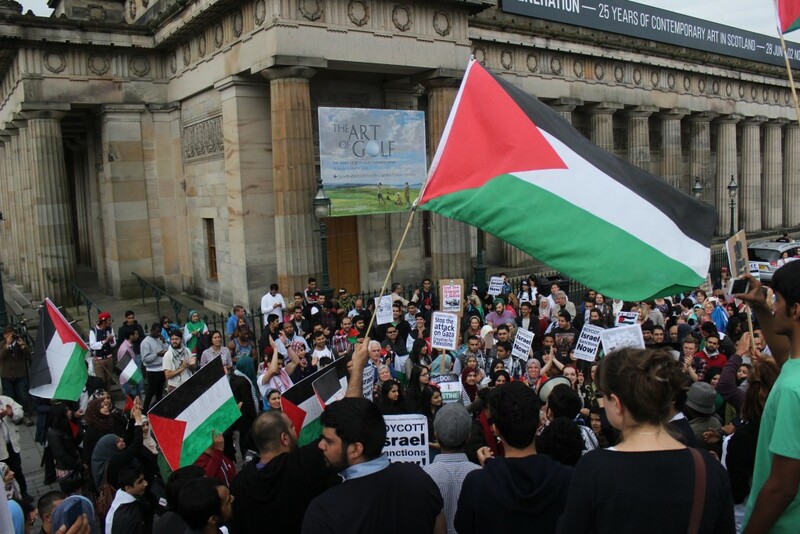 The Palestine Solidarity Campaign had just about managed a statement, but that was notable only for the absence of the inflammatory language routinely directed at Israel, including accusations of “war crimes” and comparisons with the Nazi regime’s slaughter of the Jews. Before offering some thoughts as to why this is the case, it is necessary to first address the elephant in the room. Any supporter of Israel who writes about the oppression suffered by Palestinians in the Arab states will inevitably be charged with “hypocrisy.” You will condemn Assad for bombing Palestinian camps in Syria, the argument goes, and yet you practically celebrate Netanyahu for doing much the same in Gaza. Don’t you dare co-opt the Palestinians of Syria, whom you kicked out in 1948, to make your case! The silence of leaders of Palestine solidarity activists is in many ways confirmation that their movement is motivated primarily by detestation of Israel’s existence, rather than advocating for Palestinians wherever they may be. Hence the need to disregard the hypocrisy charge, and loudly ask, “Why?” Why have there been no angry demonstrations in Western capitals? Why has no one organized an aid convoy to Yarmouk, as has happened many times with Gaza? Why are none of these solidarity groups demanding war crimes trials for Assad and his collaborators, Syrian and Palestinian, along with IS? Why are the self-identified scholars of Palestinian affairs not accenting the fact that Yarmouk’s plight further illustrates a well-established pattern in the Arab world of violence against the Palestinians, as evidenced by Kuwait’s expulsion of 200,000 Palestinian residents following the 1991 Gulf War, and Libya’s expulsion of thousands more in protest of the 1994 Oslo Agreement? As well-taken as this observation is, Hasan, in his desperation to distance himself from Israel’s supporters and the “usual coalition of neoconservative hawks and so-called liberal interventionists in the west,” signally failed to offer any explanation as to why this outrage is so selective. The answer lies in the very anti-Zionist ideology that both animates the Palestine solidarity movement and restricts, through its dogmas, the ability of that same movement to properly understand the social and cultural forces acting on Palestinians in Arab countries. At the heart of anti-Zionist ideology is a theory of original sin that haunts its Jewish bearers for eternity. The “Nakba” of 1948, understood here as the ethnic cleansing of Palestinians by the forces of the Yishuv, was not a self-contained event that occurred during a period of tectonic population transfers across the globe, including the 12 million Germans expelled from Central and Eastern Europe and over 800,000 Jews banished from Arab countries. Rather, the Nakba perpetuates itself over succeeding decades, manifesting itself in every single interaction between Israel and the Palestinians. In more simple terms, the Nakba didn’t end in 1948. It is still going on, and the sin lies with its originators, the men and woman who created the State of Israel, and only them. Consider, in the light of that introduction, the statement of Britain’s Palestine Solidarity Campaign (PSC) on Yarmouk, issued a few days before it began an effort to introduce Israel’s treatment of the Palestinians as an issue in the UK’s forthcoming election. “Most of the Palestinian refugees in Yarmouk are originally from the northern part of Palestine, mainly from Safad, Haifa, and Jaffa and were violently forced out of their homes during the Nakba,” the statement explained. What this implies is that Palestinian life in Syria hasn’t changed one iota in almost 70 years; the refugees are still gazing longingly in the direction of the border with Israel, thinking only of their original homes. Yet, as Mutawalli Abu Nasser made clear to the Electronic Intifada, the experience of decades in Syria generated authentic feelings of solidarity among its Palestinians, who understood that they had a stake in the society where they grew up. Moreover, the passage of time and the consistent growth of the Palestinian population mean that the vast majority of those born in Yarmouk never had any direct experience of the Israelis; indeed, their first taste of actual displacement came at the hands of Bashar al-Assad, whose name is visible by its absence from the PSC statement. Equally important is the fact that many of the well-known figures within the Palestine solidarity movement have openly supported Assad, in keeping with a general tradition of kowtowing to Arab dictators. George Galloway, the former British parliamentarian who famously saluted Saddam Hussein’s “courage, strength and indefatigability,” has warned that the “people who are trying to bring down Bashar are the same people who helped bring down [Muslim Brotherhood leader Mohammed Morsi,] the elected president of Egypt.” Sharmaine Narwani, one of The Huffington Post’s more unhinged commentators on Middle Eastern politics, took to the website of Vladimir Putin’s mouthpiece RT with an article—partly eyewitness, entirely apologia—exonerating Assad’s regime for the situation faced by Palestinians in Syria. With individuals like these setting the tone of what passes for debate in the Palestine solidarity movement, small wonder that the devastation of Yarmouk has been largely met with bemusement, indifference, and the wholesale revision of recent history. To think in this way, though, would put the interpretation of the Nakba as an ongoing Israeli sin at risk, by introducing additional layers of unwelcome complexity. If Netanyahu can be called a war criminal, then why not Assad? If Palestinians in Yarmouk need solidarity and assistance now, how does talk of 1948 and the “right of return” help them? These and similar questions remain unasked by those who paraded through our streets with Palestinian flags last summer. Until they start asking them, more Palestinians will die in Syria and elsewhere in the Arab world.